New Panchayati Raj Act - 2018 How hard it is ready.According to the Telangana Panchayati Raj Act, the gram sabha should be maintained properly every two months.At the village level, there are about 18 departments of government representatives.The misfortune is that people are not aware of these things.Every two months a meeting of the House is to be convened.VRA, Anganwadi Activist, Electric Lineman, Ration Dealer, IKP Administrator, Swacha Bharat Coordinator, Forest Beat Officer, Water Lineman, Grama Karaobar, ANM, Chief Government Head, and others should attend the Village Gram. According to the Old Panchayati Raj Act, the Village Council is conducted twice a year. Who is coming to the house and who is missing is unknown. I do not know what decision was made. Indian democracy, one of the largest democracies in the world, can not be ruled by parliament, legislative assembly, and management. Panchayat systems in the rural areas where more than 70 percent of the people are living are the foundations for our public worship. So they have to focus on them. If it is in village level, then it will definitely be up to Delhi. In spite of the Telangana government, Telangana Panchayati Raj Act has been created to intraspecific democracy in rural areas. 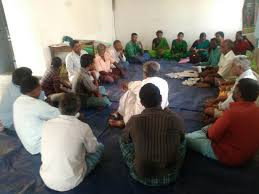 The panchayat raj was built by the Mahatma Gandhi drama Gramaswara's vision of centuries as a conduit of the traditional panchayat system in South Asia with modern public democracy. With the self-governing villages, Gandhiji's ambitions to convert to the foundation of the Panchayati Raja system with decentralized governance have been ruled out by the rulers. Telangana state has 12,751-gram panchayats. There is no doubt that the development of this creature developed by Chief Minister KCR with the will of the Panchayat to be self-reliant.